Each of the CD’s five songs spotlights a different facet of Catherine’s amazing talent. Kicking off with "I Did, I Will, I Do," the album hits high gear right away with a brash, no-nonsense anthem featuring the incisive guitar work of Tim Bovaconti (Burton Cummings, Ron Sexsmith, Leonard Cohen) in a take-no-prisoners paean to the power of love. In "Fly," we hear in Catherine's voice and lyrics the determination of a survivor of the fickle fates of love. Virtuoso bassist Alain Caron (Alain Caron Band, Uzeb) underscores Catherine in a riveting melodic duet between voice and fretless bass. Next, the haunting melody and lyrics of "With You" are perfectly complemented by Jack Gelbloom's (Take Five) evocative jazz piano and Doug Cotton's (Format) tasteful precision drumming. Kicking it up again with "Say That You Want Me," Catherine shows that she knows how to rock with the best of them. Tim’s guitar punctuation and Jack's infectiously joyous B3 are anchored by producer Alan Hardiman's tight bass line. The album wraps up with "You're Still Mine," a love song of steadfastness and faithfulness in the face of life's struggles and shortcomings, aimed as much at your children as your lover. 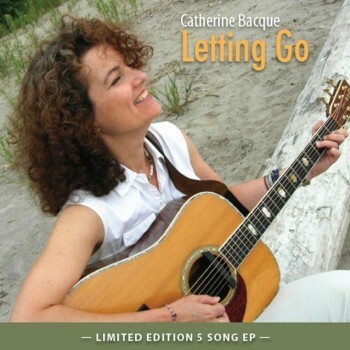 Catherine is a Canadian singer/songwriter with roots in 60's and 70's folk, pop, and rock. Her style ranges from jazzy ballads to straight out country rock. According to her mother, Catherine sang in the cradle while her father played Vivaldi and Benny Goodman on the stereo. Later, her parents introduced her to the Beatles, Elvis, Duke Ellington, Gilles Vigneault, Monique Leyrac, Gordon Lightfoot and Joni Mitchell. Catherine went on to discover Emmylou Harris, traditional Canadian folk music, and classic American country artists such as Patsy Cline and Hank Williams. Today Catherine loves to listen to Sarah McLachlan, Dala, The Dixie Chicks, The Tragically Hip, Melissa McClelland, Sheryl Crow, and Kathleen Edwards.